Purchasing a monitor for your system is nowadays a bit tricky than it was ever before; since they are available in a vast variety. A computer monitor can be as cheap as $100 (or even low) and as expensive as $1000 or more. Refresh Rate is one of the most crucial factors when finding a good monitor for your rig. It matters the most when it comes to gaming setup. The refresh rate is measured merely at which new pixels are loaded on modern LED / LCD monitors. The more refresh rate, the smoother your gameplay/videos will look. 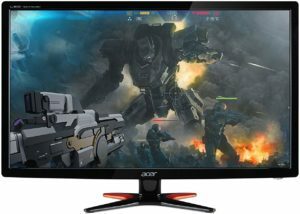 In this article, we have listed out the Best 120 Hz Monitors. Read along to know more. Best 120 Hz Monitors – Our Recommendations! The main highlight of this monitor is its 144 Hz refresh rate. We found the dynamic 1ms response time had reduced deviations in transition times. The image reproduction was bright, with we had no issues playing with the monitor at the highest resolution possible. Also, the low cost makes it an attractive option for gamers on a tight budget. The absence of inbuilt speakers could be a bummer for some users, but we generally use external speakers. We also like the ‘Lightboost’ tech that comes with the specs. If you use Nvidia cards, this monitor could produce bright images over stock settings. Here are some of the spec highlights given below. This is yet another value monitor which offers a refresh rate of 144 Hz. It comes with AMD FreeSync and goes well with AMD Radeon GPU’s that support it. It also comes with 2 Watt speakers inbuilt into the frame and eliminates the need for an external speaker system. It is a 1080p gaming monitor and should support the highest settings with even a mid-range primary GPU of today’s day and age. The stand ergonomically designed, that can adjust to full hight-tilt-swivel-pivot adjustments to accommodate any type of desk. This humongous Alienware branded monitor from Dell is for the premium segment and is a joy to experience it. The 1900 Radius with a 21:9 aspect ratio maximizes your field of view. At an overclocked refresh rate of 120 Hz, this gaming monitor is a joy to use. The 3440×1440 pixel resolution makes it look clean and not blurry unlike other monitors in the range which offers resolutions of 2560×1080 in the 34″ segment. With adaptive refresh rates and G-sync, the picture quality is smooth and bright. We hope this list helps you to choose the right product for yourself. Once again, we would like to point out that no display can promise you to deliver some exact value of refresh rate. It highly depends on what connection type you are using and your system hardware. Moreover, this list consist of monitors with budget price which are capable of delivering 120 Hz or more refresh rate. If you have any question or suggestion, feel free to contact us directly or use the comment section below. Thank You! Previous PostAMD x470 vs. x370 Motherboard Chipsets Specs: What's the Difference?